The walls of our house are built from local stone. This is a good thing. It is just as good as stone from somewhere else, but closer. It also means that the barn looks right. There is an adage in the stone wall building game that once you pick a stone up, you put it in its final place. 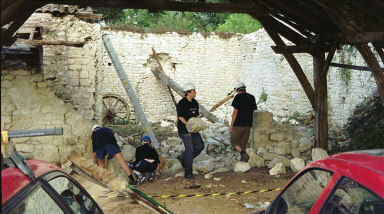 Handling a stone more than once is a waste of time and should be avoided. Hah! You try it. This pile was labouriously carried from the collapsed back half of the barn and stored under the hangar by Jamie and his pals. The sea islanders off the coast of Geogia may have an old saying: Stone don’t care about rain. Firewood do - and we needed somewhere to store firewood. So I moved the pile to the other side of the yard using a wheelbarrow and several days. A year or so later I decided to build a workshop. No prizes for guessing where. This peripatetic stone pile has now been cornered, trapped between the road and the steep bank down to the pottager. It cannot escape and will remain where it is until I am ready to use it. Well, that is my fervent wish. But this is only one of two substantial piles we have. 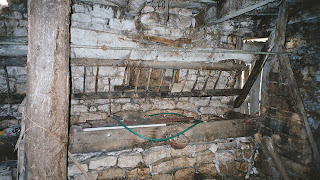 This is a section of manger that ran the length of what is now our kitchen. The stone which forms the base of the manager weighs more tonnes than I care to think about. Most of it was taken out and piled up outside the small barn. This, it transpired, was just were we wanted to have the afternoon terrace (a terrace which is in shade in the afternoon, the morning terrace at the other end of the house is usually steaming by 3pm). So when we levelled the ground for the terrace we had to move the stone pile. We didn’t want to move it very far, so it just got pushed it across the path some three or four metres. Time passes… about two years actually… the sound of terrace building is drowned out by the sound of drumming fingers. I have been working on a theory that when people ‘drum’ their fingers, they start with the little finger and work towards the index finger, try it and let me know – but I digress. One day I decide I am fed up with looking at this pile of stone and decide to do something with it. So I cart loads of it down the hill and build a wall. It takes three days, but at least I won’t have to move the stuff again. Looking at the stone which is left I realise how little I have used. So I cart loads of it up the hill and build another wall. ...but do not have enough to build a full-height lighthouse.